Get out the bacon, ham hocks and assorted sausages! 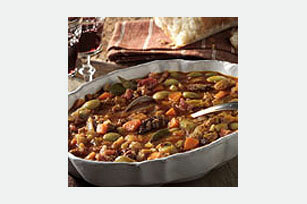 This Asturian-style bean stew is a super hearty dish that can feed a crowd—deliciously! Soak beans overnight in enough water to cover by 2 inches; drain. Cook bacon in large stockpot on medium-high heat 4 min., stirring occasionally. Add onions, leeks, carrots and garlic; stir. Reduce heat to low; cook 15 min., stirring occasionally. Add beans, ham hocks, sausages, bay leaves and paprika. Add enough water to just cover ingredients in stockpot. Bring to boil over medium heat, stirring occasionally. Skim off foam and fat from top of stew. Reduce heat to low. Simmer, partially covered, 2-1/2 hours or until beans are tender. Skim fat from top of stew. Remove ham hocks. Remove meat from the bones. Return meat to pot; discard bones. Remove bay leaves; discard. Season with salt and pepper. Substitute chorizo sausages for the longaniza sausages.